Nightwatch, Rembrandt's infamous painting depicting the Dutch Militia and the story behind it, is the subject for another visual feast by Peter Greenaway (The Cook, The Thief, His Wife and Her Lover, Belly of an Architect, Prospero's Books). First, just like any Greenaway film, I had a hard time getting into this. 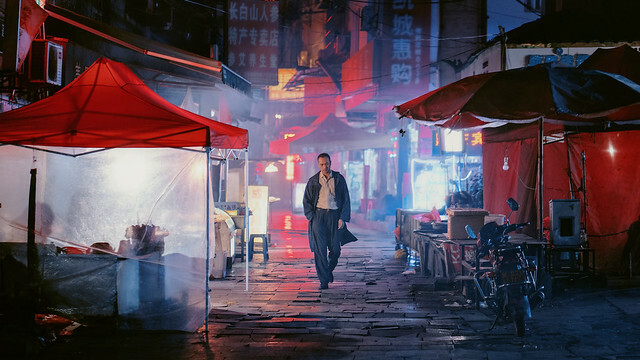 With slow tracking wide shots and people bantering constantly, the experience is not unlike passing through a crowded museum and overhearing a snippets of people's conversations. Watching it on my 19" TV doesn't help either. But Nightwatching is different. Sure it doesn't catch fire until Rembrandt unveils the infamous painting commissioned by the Amsterdam Militia that ultimately dooms his career. But it's a fascinating one. I was fully invested in the story and all the goings on behind that painting. A great art history lesson light show. A companion piece to his Nightwatching, Prof Greenaway makes a compelling case of the visual art illiteracy in our text heavy world. 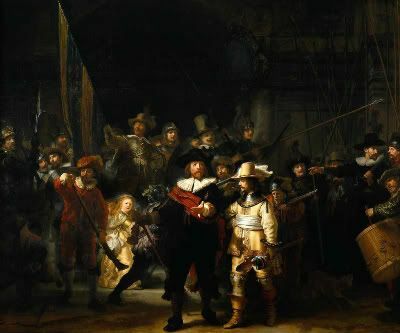 The essayistic film breaks down the painting Nightwatch in 34 clues as the filmmaker explains Rembrandt's intention of accusing the Dutch Militia of a murder. With Greenaway's head floating around narrating the whole time could be seen as powerpoint presentation gone mad but it settles down after a while as the forensic investigation unfolds. Things are acted out as interviews with actors in characters and it intercuts with scenes from Nightwatching. Really fascinating stuff. How come they don't teach this in art history classes?